eBay MANGROOMER Do-It-Yourself Electric Back Hair Shaver Product Image Product Information The Mangroomer Do-It-Yourself Electric Back Shaver is absolutely the best way to get rid of unwanted back hair. This one-of-a-kind device features a large blade that enables you to shave larger areas of your back with ease. 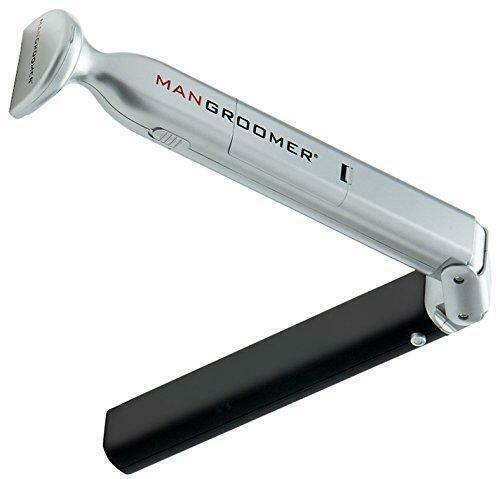 The Mangroomer's cutting-edge blade design delivers extremely close and smooth results without the potential of ingrown hairs that are commonly caused by straight edge and foil shavers. And with the unique patent-pending design, the Mangroomer opens to a staggering 135-degrees so you can reach all areas of your back from different angles with ease. Rid yourself of unsightly, unwanted back hair without waxing, chemicals, laser, or electrolysis -- all from the comfort and privacy of your own home. Why is the Mangroomer Right for You? One time purchase with one low cost. Easy to use, lightweight, and do-it-yourself. Offers a fully extendable and adjustable handle that locks into place at various lengths to reach even the most difficult middle and lower portions of the back for men of all sizes. Allows you to rid yourself of unwanted back hair in the privacy of your own home -- not some fancy or overpriced salon or spa. Completely painless, unlike waxing, chemicals, laser, or electrolysis. Folds into a neat, compact size for discreet storage or travel. Shave your back whenever you feel you need it, and it is perfect for quick touch ups. Mangroomer vs. Alternate Hair Removal Options Before the Mangroomer, there were three hair removal options -- waxing, chemicals, and laser/electrolysis. Waxing is an effective wa Shave off all your back hair effortlessly with the new mangroomer essential back shaver Unique patented design enables men of all sizes and shapes to easily reach all areas of your back from different angles with ease Sleek, lightweight, compact design goes from its discreet stored position to fully functional easily in a matter of seconds Operates on just 2 AA batteries/. Battery Charge Life: Up to 5 Hours About Us Payment Shipping Return Contact Us All products sold through our eBay store are new and have never been used. Our main goal is providing affordable products for people who demand excellence in their purchases. Immediate payment is required upon selecting 'Buy It Now' or upon checking out through your eBay cart. We accept payment through either PayPal or major credit card. Standard shipping is always free of charge. Orders with standard shipping travel via the best courier based on size and weight. The estimated delivery window will also be displayed during checkout. International shipping is not available at this time. We want you to be totally satisfied with your order. If you wish to return a product, please request a return within 30 days after your order is placed for a refund on the purchase price, minus shipping, handling and other charges. Refunds will be credited to the original form of payment. To begin your return request, please message us through the eBay Messaging system. Refunds will be issued in the original form of payment and include the price of the item/ any applicable taxes. Original shipping costs (if any) will not be refunded unless the item being returned is damaged or defective. Unfortunately, we do not offer exchanges at this time. We would love to hear from you! If you have a question about a product or need assistance with your order, please contact our Customer Service team by sending a message to our eBay account. A customer care representative will respond to your message as fast as possible.